Mau’s Cupcake Cafe in Quezon City will be at SM Sta. Mesa! When in Manila, I had the privilege of covering what could be the city’s next go-to place when it comes to all things cupcake. Mau’s Cupcake Cafe in Quezon City was this quaint, little place nestled along the busy street of N. Domingo, where I met the very pleasant and down-to-earth couple and cupcaketeers, Mau and Bjorn Carreon (aka Mr. and Mrs. MC). Mau’s Cupcake Cafe is located along AEQ Centre Plaza Unit #3, 131 N. Domingo Avenue cor. Betty Go-Belmonte Street, Cubao, Quezon City. If you’re not familiar with the area, it’s right behind Kalayaan College and the Betty Go-Belmonte LRT Station, parallel to Aurora Boulevard. Nearby landmarks are Chocolate Lovers, Robinsons Magnolia, and 53 Benitez by Primaries. Mau and Bjorn were based in Singapore for seven years before finally coming home last year. Both were IT graduates, and had no idea they would one day open their very own cupcake business. While in Singapore, Mau was given a tiny oven where her baking experiments began. Soon enough, her recipes, which friends and family members really enjoyed, grew until the couple came home and started getting bulk orders. One overwhelming order required Mau to bake 500 cupcakes! Eventually the tiny oven was replaced by a bigger one. All cupcakes are homemade and handmade with love by Mau. Whenever their refrigerator is too full with cupcake orders, they makeshift their bedroom into an extended refrigerator–by turning up the air-conditioner. Since their small business grew, the couple decided to open a store where neighbors and students from Kalayaan became their regular customers. Every Friday night, KaMo (or Kalayaan Music Organization) plays acoustic tunes inside the cafe. Writers also like to meet in Mau’s to have little discussions and workshops. Which is why aside from cupcakes, Mau’s Cupcake Cafe now offers pasta, sandwiches, rice meals, and cold beer. Bjorn’s love for coffee is seen in the beverages they offer as well. Last night right after work, the Cupcake picked me up and we headed straight over to Mau’s. From Bonifacio Global City, we passed C5 (to avoid the heavier traffic in EDSA), made a U-turn to go to Ortigas, then crossed EDSA to enter Greenhills area. From Ortigas Avenue, we turned right to Santolan, then entered Mariposa before turning left to P. Tuazon and crossing over to Betty Go-Belmonte. When we arrived, we found Mau and Bjorn seated on the porch of their shop just talking. What originally was just a cover of their cupcake cafe became a kwentuhan session on their adventures in Singapore, our love for coffee, and playing ultimate frisbee. They also introduced us to all the flavors they had in store. Mau explained that the flavors change every week, but that the staple cupcakes are their Oreo Cheesecake Cupcake (which was my favorite!) and the Blueberry Cheesecake Cupcake. I was also able to try the Red Velvet Cupcake, since that’s usually a staple order of mine every time I come across a cafe, bakery or restaurant that sells Red Velvet. Unlike the ones I’ve tried in BGC, Mau’s Red Velvet Cupcake is moist, and the cream cheese used is really good! It’s not too sweet, so you won’t feel full right away. The Cupcake, on the other hand, really enjoyed the Nutty Yema Cupcake. It was very buttery, but again wasn’t too sweet. I liked it, too. Especially the frosting! 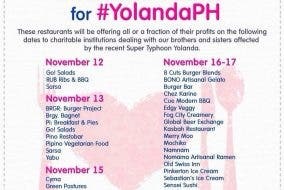 Dine for a Cause for Yolanda Victims – Eating Out? Why Not Help Out While You’re At It?